The TAB188L22 car or truck seat rail or floor tablet mount can be used with all large tablets 8.9 to 18.4 inches in screen size, including Apple iPad Pro, iPad Air 2 and iPad Air, iPad 4, 3, and 2, Samsung Galaxy View, Galaxy Note 10.1, Galaxy Note Pro 12.2, Galaxy Tab 4 10.1, Galaxy Tab Pro 10.1, Galaxy Tab Pro 12.2, Galaxy Tab S 10.5, Google Pixel C, Nexus 10, and Nexus 9, and LG G Pad 10.1. 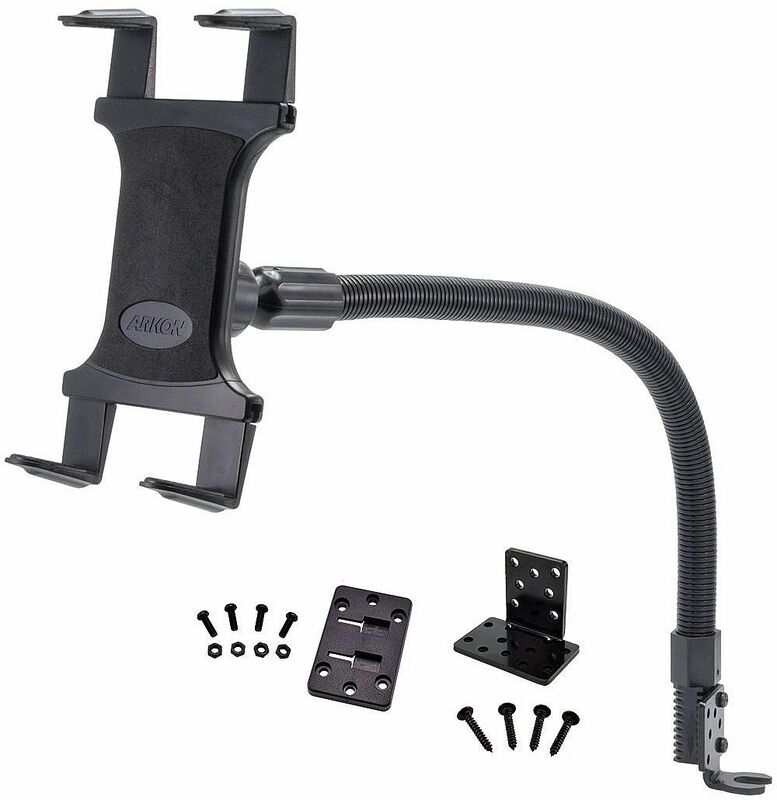 This mount includes Arkon’s Slim-Grip Universal Tablet Holder and a seat rail or floor mount with 22” flexible aluminum gooseneck. The Slim-Grip tablet holder features a spring-loaded design that makes it easy to insert or remove the tablet by pushing down on the lower legs of the holder with one hand. Included with the holder are 10 support legs (4 short, 2 medium and 4 long versions). Choose the 4 legs that provide the best fit for your tablet. These insert at the top and bottom of the holder and can be easily adjusted in order to keep any side buttons and ports unobstructed. For most large tablets, the best mount holder configuration is to attach 2 short support legs on top and the 2 long support legs on the bottom of the holder. For smaller tablets, use all 4 short support legs on the holder. For larger tablets including iPad Pro, use all 4 long legs. For vertical viewing, adjust the 360-degree swivel and then re-tighten. The aluminum car seat rail or floor mount is ideal for those who prefer mounting their tablet somewhere other than the windshield or dash. Use a socket wrench to install the mount to the car’s seat rail. Bend the 22” gooseneck for exact positioning of the tablet. Optional floor brackets are included for screwing the mount directly into the floor of the vehicle. (Warning: Drilling into the vehicle’s floor may damage the vehicle. Use caution and consult a mobile install professional to avoid drilling into any sensitive vehicle components.